SingleRing | Being single has never looked so good. should put a ring on it. Being single has never looked so good. The unisex SingleRing (Singelringen®) is a symbol that says “My life is fabulous as it is, yet I am open to the possibilities.” It is an empowering reminder to the SingleRing members that they are already complete. You are single, uncommitted and proud. You enjoy being single, perhaps are open to possibilities, but prefer to wait for the right person to come along rather than dating indiscriminately. If that person comes, good, if not, good too, because you are already complete as you are. That is you. Single and Proud. 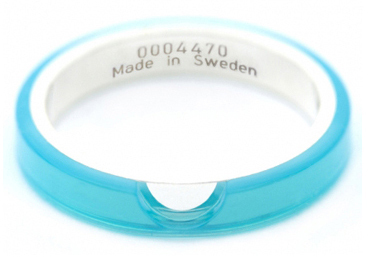 SingleRing (originally Singelringen®), a unisex ring made in Sweden, is based on the idea that many singles, just like most married people, want to show their partner status through a finger ring. Of course, to singles it has an added purpose: to signal to other singles that they are just that - Proudly Single. Featuring a turquoise color acrylic layer shining over a silver band. It is worn on the right hand or on a neck chain as the opposite of a wedding ring, to signify that the wearer is single. Since the launch in 2005 over 200,000 singles in over 20 countries around the world have purchased the SingleRing. Between 2005 and 2007, the SingleRing constantly received massive press coverage in large daily papers, high-end fashion magazines, celebrity press, radio shows, TV shows and on the Internet. Celebrities all over the world celebrate the Singelringen® concept and many of them wear the rings or buy them as gifts for Single friends, relatives or colleagues. Ready to Join the Proudly Single? You are on your own but you are not alone Worn by over 200,000 singles in 20 countries around the world and a list of Hollywood celebrities, the eye-catching sterling silver and turquoise band celebrates you, solo with style. The light-reflecting crescent shape cut into the turquoise outer band signifies openness to new conversations, friendships or romantic relationships. Let your finger do the talking. Stand for who you are and stand out anywhere! © SINGLERING.ORG. All Rights Reserved.